A search dog handler testified Tuesday that her canine picked up Laci Peterson's scent along a pylon at the Berkeley Marina where Scott Peterson launched what he says was a solo fishing trip the day his wife vanished. Eloise Anderson, a dog handler with the Contra Costa County Search and Rescue team, said her dog, a Labrador named Trimble, came to the marina on Dec. 28, 2002, four days after Peterson reported his pregnant wife missing. "I was looking to see if my dog could detect Laci's scent in the marina area there," Anderson told jurors at Peterson's double-murder trial. Prosecutors allege Peterson killed his wife in their Modesto home on or around Dec. 24, 2002, then drove to San Francisco Bay and dumped her body. The badly decomposed remains of Laci Peterson and the couple's fetus washed ashore in April 2003, not far from where Peterson launched his fishing trip the day Laci vanished. Anderson said her dog found no scent trail for Laci in one portion of a parking area at the marina but that Trimble later tracked Laci's scent to the water's edge. Anderson, using a large screen aerial picture of the marina, pointed out for jurors where Trimble picked up Laci's scent. Anderson said Trimble followed the scent from the parking area, along a tree line and down a pier, where the dog stopped at a pylon at the water's edge. The dog "stopped, checked out over the water, the wind was coming into her face ... turned around and gave me end of trail indication," Anderson said. Anderson again pointed to the large aerial photograph. "She went to the end of her line, pulled steady ... level head and maintained that posture ... all the way out to that pylon," Anderson said. "That's a behavior that indicates that she's working a valid scent trail." Judge Alfred A. Delucchi ruled during pretrial hearings that jurors would hear some, but not all, details gathered by the scent-sniffing police dogs. 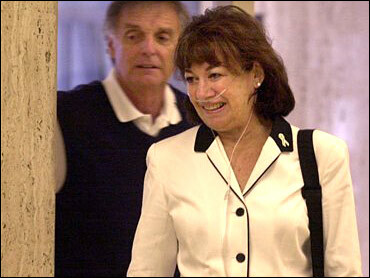 Calling the details "iffy, at best," Delucchi in March tossed out prosecution claims that other dogs had detected a broken trail of Laci Peterson's scents leading from the Petersons' home to the warehouse where Scott Peterson kept his boat and along the boat's rim. Delucchi said the marina evidence was admissible because Scott Peterson had admitted going to the marina, and the bodies washed ashore near there. Earlier in the day, one of Anderson's supervisors testified about how dogs pick up scent and follow trails as they search for missing people. Christopher Boyer spent much of the morning explaining to jurors the mundane details of dog-tracking, scent theory and skin rafts. Boyer testified that he collected a number of items from the Peterson home to help in the search for Laci, including a hair brush, a pink slipper, sunglasses, and slippers. Anderson said she used the sunglasses as scent for her search dog. On cross-examination, defense lawyers questioned the reliability of dog-tracking evidence, constantly referring to the technique, as Boyer did himself, as "scent theory" rather than science. Defense lawyer Pat Harris noted that during a pretrial hearing, Boyer spoke of dog-tracking as "not a science. It's an art." Boyer remained steadfast that scientific literature supports the accuracy of dog-tracking. "You use the word theory, correct?" Harris asked. "It's theory, right?" Harris asked again. "I have read it as fact," Boyer replied sternly. Harris added that the class used to teach dog handlers the technique is even called "scent theory." Boyer explained for jurors how skin rafts shed constantly from one's body, leaving behind a trail of scents. Harris noted that scents can be combined if, for example, two people live together. But Boyer argued that the dogs are trained to determine which scent to track. Boyer also acknowledged that although dogs can pick up a scent, they cannot determine how long that scent has been there or how it got there. Boyer was assigned to supervise a team of dog handlers as they searched for clues at the marina in the days after Laci vanished. Harris suggested Laci may have previously been in Peterson's truck and boat, leaving behind skin rafts that the dogs may have later smelled. There has been no dispute that Peterson drove his truck and boat to the marina that Christmas Eve morning. "If someone had been in that truck within 24 hours ... their skin rafts would be all over the truck, correct?" Harris asked. "There's no way the dog can determine when that person was in the truck or the boat, is there?" Harris prodded.